The New York Bank Hoard. Roll of 20 - 2009 1 Troy oz. Silver Eagle - Roll of 20 coins GEM BU (Brilliant Uncirculated). Being the official silver bullion coins of the U. Each one is guaranteed by the United States government in weight 31.101 grams containing 1 troy oz. 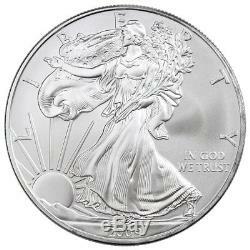 Silver Eagle coins in GEM Brilliant Uncirculated (BU) at a great price. In addition to being a sound investment, rolls of 20 Silver Eagles come in convenient storage tubes making them easy to store. The Very Recognizable Designs Featured on Silver American Eagle Coins. The designs featured on Silver American Eagles, both front and back of the coin, are some of the most recognizable designs in the coin collecting community. On the front (the obverse) is a rendition of Adolph A. Weinman's Walking Liberty which shows Lady Liberty striding across the coin draped in an American Flag and carrying branches of laurel in her left hand. Her right hand is extended in front of her, as if she is reaching towards the future. In the background is a mountain range with the sun shining from behind the peaks. The well-known design first appeared on U. Half Dollar coins from 1916 to 1947. Inscriptions on the front of the 2009 Silver Eagle coins are "LIBERTY, " "IN GOD WE TRUST, " and 2009. On the back side of the coin (the reverse) is John Mercanti's equally well-known heraldic eagle design. The very patriotic eagle with outstretched wings is complimented with a shield featuring vertical stripes in front of its body, an olive branch in its right talon and a clasp of arrows in its left talon. The original thirteen colonies of the United States of America are represented on the coin by thirteen five-pointed stars arranged in an inverted triangle above the eagle's head. Additionally, the eagle holds in its beak a banner upon which is declared E PLURIBUS UNUM. " Other flip-side inscriptions include "UNITED STATES OF AMERICA, " "1 OZ. FINE SILVER, " and "ONE DOLLAR. Why Add a Roll of 20 2009 Silver American Eagles to Your Collection? 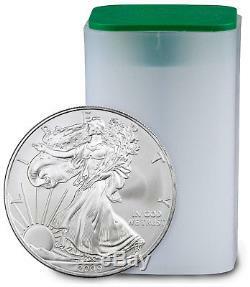 Grab your rolls of 20 2009 GEM BU Silver American Eagles while they are still available. Whether you enjoy collecting Silver Eagle coins for their iconic designs, the history behind the coins or as a store of wealth in hopes of their future value, getting them in bulk in counts of 20 in original U. Mint tubes is a great way to collect them. Specifications for this Roll of 20 - 2009 1 Troy oz. Heraldic eagle with shield and thirteen five-pointed stars. We cannot make any price adjustments after the sale is complete. Product Photo Policy: MCM attempts to display product images shown on the site as accurately as possible. We take all of our photos in house and due to reflections on the mirrored or proof surfaces of a coin there may appear to be'black' when there is not. If a coin has a color on it at all it will be described as'colorized' in the description or title. That's the MCM way. This listing is currently undergoing maintenance, we apologise for any inconvenience caused. The item "Roll of 20 2009 1 Troy oz. 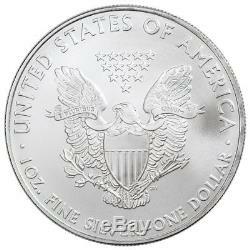 999 fine Silver American Eagle $1 BU Coin SKU26728" is in sale since Thursday, July 19, 2018. This item is in the category "Coins & Paper Money\Coins\ US\Commemorative\Modern Silver/Clad (1982-Now)". The seller is "mcm" and is located in Sarasota, Florida. This item can be shipped worldwide.